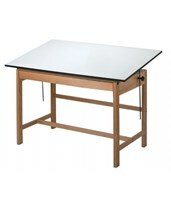 There are a few questions to ask yourself before you choose a drawing table. 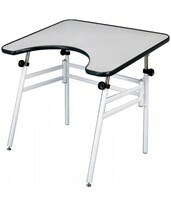 What type of tabletop do you want? 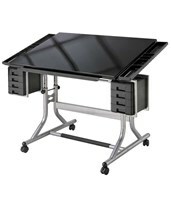 The split top drafting table has an adjustable section that tilts and a fixed section that stays flat, while the solid top drafting table has an adjustable tilt over the entire work surface. 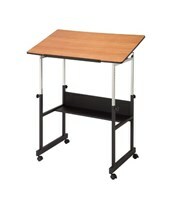 Do you prefer to work standing up or sitting down? 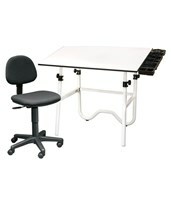 An adjustable height drafting table can accommodate you whichever your choice. 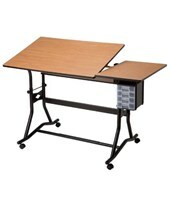 Is space at a premium? 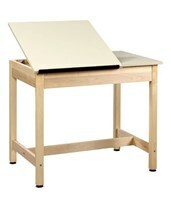 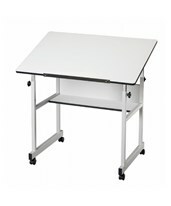 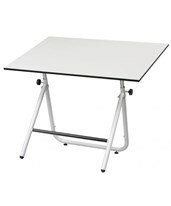 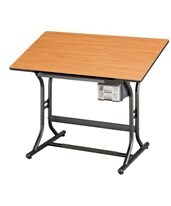 A folding drafting table can fold down to a width as small as 5 inches to keep out of the way when not in use. 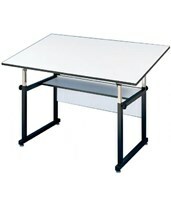 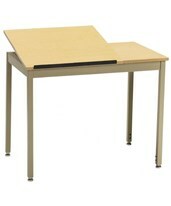 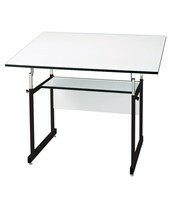 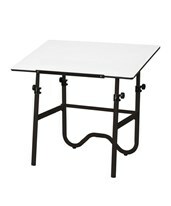 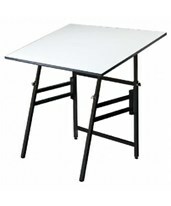 For an extremely stable drafting table, have a look at the professional four-post drawing tables. 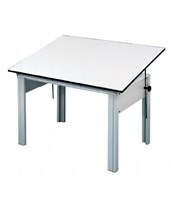 Drafting tables come in a wide variety of sizes, with table tops as small as 18” x 30” or as large as 37” x 84” and also have different ranges of tilt. 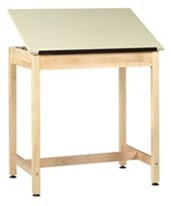 For drafting table bases, you can choose wood, steel, or solid oak in different finishes. 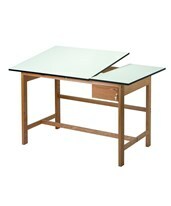 Drawing board tabletops can be made of wood, glass, or melamine in different styles and colors. 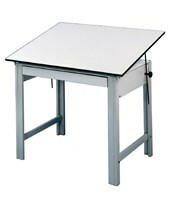 Some drawing tables feature storage options, such as locking tool drawers and shallow reference drawers. 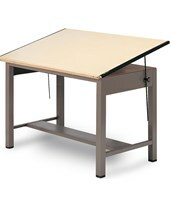 Some drafting tables even have space for a CPU and flat-screen monitor, or storage compartments for portable drawing boards. 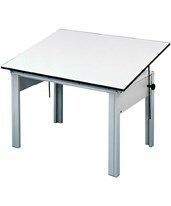 Whatever your drafting equipment needs, Tiger Supplies carries a full range of drafting supplies and has the drawing table for you. 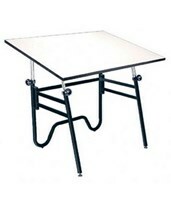 Manufacturers such as Alvin, Mayline, Safco, and SMI provide an abundance of high-quality drafting tables, made with durable materials in attractive colors and styles to choose from. 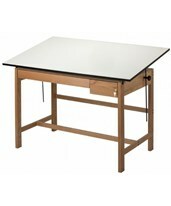 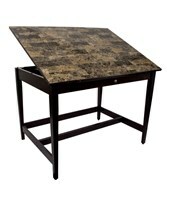 You can be sure that you'll find the right drafting table with Tiger Supplies. 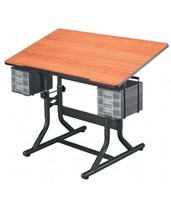 Adjustable Height: 29" - 46"
Adjustable height 26" to 32"
Adjustable height: 29" to 45"
Adjustable height: 30½" to 44"
Adjustable height: 29" - 44"
Adjustable height: 29" to 44"
Adjustable height: 24" to 44"
Adjustable height: 29" to 41"
Fixed height: 29" or 30"
Fixed height: 30" or 33 1/2"
Adjustable height: 27" to 40"